Why you DO need a portable Air Compressor…. An air compressor is a machine that is relied upon heavily across countless industries. A portable air compressor gives business considerable benefits around their factories and plants. The ability to move the air compressor from one location to another with minimal effort is clearly its leading benefit. The smaller size and lighter weight of portable air compressors mean they have a much more flexible use. Their small and compact size makes storage space required minimal. Portable air compressors are also much quieter than their stationary air compressor counterparts. When thinking portable air compressors, the brand that comes to mind is the worldwide industry leaders HPC KAESER Compressors. 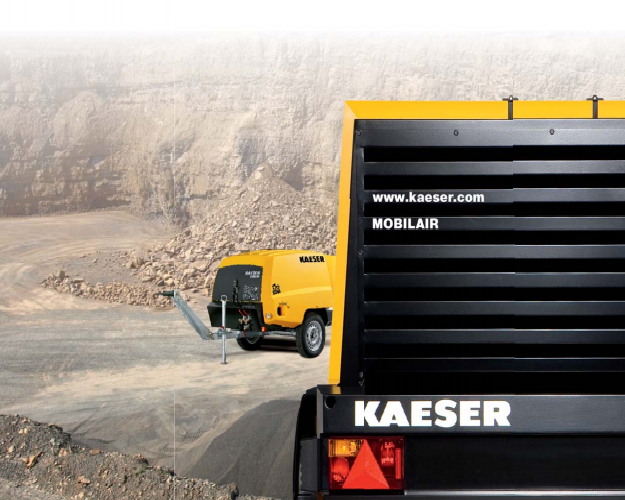 HPC KAESER has a range of portable air compressors called the MOBILAIR. These compressors are compact powerhouses with petrol engines of up to 15 bar pressure. Even the smallest HPC KAESER MOBILAIR portable compressor is more than capable of powering breakers, drills, saws, grinders, impact wrenches and impact borers. The compressor can even be equipped with an external compressed air aftercooler for applications that require cool and condensate-free compressed air. It is useful to know in our chilly British winters that the HPC KAESER compressors are built to withstand freezing temperatures with their patented anti-frost control. This mean that the portable compressor models can be relied upon with flow rates from 2-5.6 m³/min. Combined with a tool lubricator you can be sure that your tools will also not freeze and also extend the air tool service life and availability. HPC KAESER has developed a SIGMA CONTROL MOBILE designed to boost free air delivery up to 34 m³/min. The innovative compressor control is simple to use and precisely matches motor power to actual compressed air demand significantly enhancing compressed air availability and fuel efficiency. KPC KAESER has even developed an emission free portable compressor: the HPC KASER e-power. The e-power is the alternative, emissions-free drive for portable compressors useful when there is an electrical power available. The e-power is very quiet compared to its diesel counterparts making it useful for noise protection zones. Its emission free characteristic makes it ideal for use in tunnels, buildings and low emission zones. North West based Glaston Compressor Services Ltd offers a wide range of static electrical and portable diesel driven compressor equipment suitable for any application. Glaston offers air compressor hire packages which are available in oil free as well as oil flooded options. Glaston also stocks a full range of ancillary equipment that is available to hire, including desiccant dryers, fridge dryers and filtration for any specification. As well as hire packages Glaston also has a wide range of used air compressors that are available for resale. Glaston is an authorised UK distributor of HPC KAESER air compressors. For more information about the HPC KAESER MOBILAIR compressor range or any other portable air compressor visit www.glaston.com. We can also help you choose nitrogen generation equipment and vacuum blowers.